Being able to hook Power BI directly into Azure Data Lake Storage (ADLS) is a very powerful tool (and it will be even more so when you can link to ADLS files that are in a different Azure account!! – not yet available as at January 2017). However there is a problem, Data Lake is designed to scale to petabytes of data whereas Power BI has a 10GB limit. Yes this is compressed, so we’d expect around 100GB of raw data, however to load this you need 100GB+ of RAM available on your PC, so it’s hard to actually reach the limit with a single dataset. There’s obviously a disconnect in scalability here. In some datasets we can just use U-SQL to aggregate the data and pre-summarise by the list of fields that we actually want to analyse, and this is fine for additive transactional data. However if we need a many to many link or the granular details of individual rows of data then there’s an issue, how to we get this data into Power BI? The answer is sampling, we don’t bring in 100% of the data, but maybe 10%, or 1%, or even 0.01%, it depends how much you need to reduce your dataset. It is however critical to know how to sample data correctly in order to maintain a level of accuracy of data in your reports. Don’t do it. Ever. Just no. What if the source data you’ve been given is pre-sorted by product or region, you’d end up with only data from products starting with ‘a’, which would give you some wildly unpredictable results. Now we’re talking. This option will take, for example 1 in every 100 rows of data, so it’s picking up an even distribution of data throughout the dataset. This seems a much better option, so how do we do it? One option would be to include a ROW_NUMBER() windowing function in a U-SQL query that allocates each row a unique number. This filters to only 1 in every 100 rows. This method works in T-SQL, and just as well in U-SQL. However, there is an easier way. U-SQL contains the ‘SAMPLE’ clause that automates this process. Thanks to Paul (T|B) for spotting this beauty. There are two sampling options here, ANY and UNIFORM. After not being able to find anything on the tinterwebs about them I ran some tests to see what they did and how well do these methods work compared to each other. The following code runs some U-SQL over a simple two column csv file containing an arbitrary id and a name. The 640MB file contains 400 names, each repeated a number of times to build 40m rows. Names were repeated using a normal frequency distribution pattern to make the data more representative of real world data. To assess the output we can look at the distribution of the sampled data to see how closely it correlates to the distribution of the original dataset. So what happens when we take the resulting data and plot the sampled distributions against each other? The Blue line is the number of times each name appears in the original dataset (on the right axis). The Orange line is the distribution from the ROW_NUMBER() and Modulus. The Yellow line is using U-SQL’s SAMPLE UNIFORM. The Grey line is using U-SQL’s SAMPLE ANY. As you can see, the SAMPLE ANY is a terrible option to maintain data accuracy. In effect it looks like it just takes the top x rows from the file and discards the rest, which I explained earlier is a bad idea. However the ROW_NUMBER/Mod and the SAMPLE UNIFORM approaches are both staggeringly accurate to the original, with variances +/-2% for each name. This isn’t any good for exact numerical calculations (total sales £ for example), but for looking at trends over very large datasets this sampling approach is a good option. So, should you use ROW_NUMBER/Mod or SAMPLE UNIFORM? 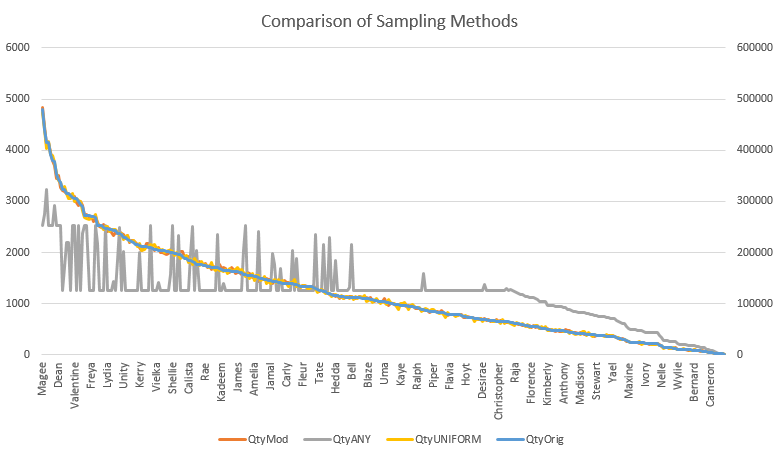 Obviously SAMPLE UNIORM is simpler code, but how do they perform compared with each other? The ROW_NUMBER/Mod approach, using the above dataset used a single vertex, with a total compute time of 29s, read 640MB and wrote 5KB. The SAMPLE ANY approach used two vertices, with a combined compute time of 2s, read 34MB and wrote 5KB. The SAMPLE UNIFORM approach used four vertices, with a combined compute time of 26s, read 766MB and wrote 5KB. So the SAMPLE ANY, although poor for data consistency allows a much faster execution by only reading a small section of the data. The ROW_NUMBER/Mod and SAMPLE UNIFORM approaches are very comparable in terms of performance, so it wouldn’t surprise me if they were doing something similar under the hood. However out of simplicity I’d recommend the SAMPLE UNIFORM method. How can we create trend line chat using power BI. 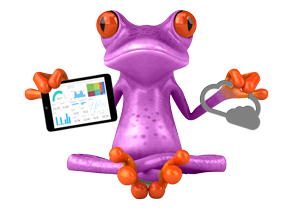 Use the analytics pane within visualisations. A quick Google will give you plenty of walk through guides.